From the tank bund ones gaze sweeps across a line of coconut trees that marks the boundary where the waves relentless break upon the shore. To reach this line, the eyes have to first travel across a keth yaya that stretches right down to the beach. The natural environment on this North-Western coastal stretch has been significantly altered. The manner in which the waters of the Deduru Oya have been diverted at the tail end of the river into a system of tanks is indeed wondrous. My thoughts wander among the lyrical remains of a prosperous past. Even today, there is much evidence that point to a splendid civilisation that once existed in the coastal area of the Sath Korale. They speak of a cultural strength that was able to withstand the violence unleashed by three European invasions. I see before me the nine tanks that make up this unique irrigation system. The six large tanks, three peripheral ones and all the asweddumized fields under these are collectively called Anawilundawa. The six large tanks; Pinkattiya, Maradansola, Anawilundawa, Mayyawa, Surawila and Vellawali; exist as a single system and are located close to Nalladarankattuwa, which is a little beyond Halawatha (Chilaw). Although there is no longer a definite trace of the waterways that fed the system, currently they are watered by the flood waters of the Deduru Oya brought to the area via the Sengaloya scheme launched by D.S. Senanayake. The history of the tank system goes back as far as the twelfth century. It is a system that is absolutely in concert with nature and even to the untrained eye describe the wisdom of a people who knew how to engage gently with the elements. The Rajawaliya speaks of a yuva raja by the name of Thaniyawallabha who controlled the Madampe area. He was the son of Veera Parakramabahu the Eighth, who ruled from 1477-148921 A.D. It is said that the Madampe Wewa was constructed and the fields beneath assweddumized by him. This resourceful man of resolve who transformed the coastal line into a fertile stretch of paddy land is today venerated as a god by the people. In fact there is even a devale that has been built in his name in Madampe. The aluth sahal of the harvest is even today offered to Thaniyawelle Deviyo. Thaniyawallabha, according to legend was sent to the area to deal with South Indians who were diving for pearls off the Halawatha coast. From the beginning, then, his work was related to protecting what was ours and this included not just our shores, but the livelihoods and lifestyle of our people. Strong ideas and traditions, they have survived into the twenty first century, largely due to brave and wise people who walked on the path that Thaniyawallabha blazed for his people. I am tempted to say that there is no example more powerful than this of how a people quietly defend their "ourness" even as the "rulers" of the country connive with foreign powers to destroy everything we own. When the Portuguese invaded and when the Sinhalese elsewhere fled in the face of the cultural onslaught powered by guns, they were stopped at Madampe by the strong cultural traditions and prosperous economy that the Sinhalese had established there. It is true that when the Dutch arrived and after them the British, our strong agricultural base took a severe beating. And yet, there are places and people that were not entirely submerged by those violent flood waters of invasion. Anawilundawa is one such place. The lifestyle of this people which was built around these integrated system of nine tanks depicts a certain unity with the natural cycles. In many ways, understanding the universe is simply a matter of comprehending its rhythms. This is what is called buddhatvaya. The greatest environmentalist to walk this earth is the Buddha. The ancient Sinhalese villager, who was nourished by the doctrine of the Buddha, was environmentalists of the highest order. He organised his life without disrupting natures patterns. The relationship between the villager and nature, therefore, was a spiritual one. Like love. This dharmatava is also evident in Anawilundawa. The tanks gave rise to rich and verdant surroundings. There developed around the tanks and the paddy fields, thickets. There were also stretches of grass and marshy sections, completing an ecology where diversity ruled. Needless to say, animal life abounds. Over 150 bird species have been identified in this area, a quarter of them migratory. It is said that there are two main routes that migratory birds take. One is through Chendikulam in the Northern Province. There is also a corridor that passes through the North Western coast. Anawilundawa has always been a pleasant resting place for these birds. 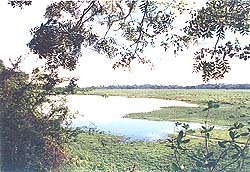 Although yet to be seriously studied, the eco system of Anawilundawa has been nominated to be declared a Protected Wetland under the Ramza Convention. This wondrous eco system was always protected by the ordinary villagers. They cultivated their lands, let loose their cattle on the grass but never harmed any creature or cut any trees. These people provided rice to the national granary. Tragedies are not always of our own making. Many decades ago, ill-planned irrigation and settlement schemes such as the Katupotha Project robbed water from the ancient Anawilundawa Tank System. The yala-maha cultivation cycles was reduced to just the maha season and here too the yields began to drop. The Sengaloya scheme was supposed to correct all this. Hope tarried but awhile in their hearts. Politicians, as is the custom of that tribe, soon set up things so that racketeers could lay their dirty hands on the sands of the Deduru Oya. The police has continued to turn a blind eye to the illegal extraction of sand from the bed of the river. Backhoe machines and Tippers invaded. The inevitable happened, there is now a six foot difference between the level of the Deduru Oya and the Sengaloya which was to carry the waters of the river to the Anawilundawa system. A civilisation based on water cannot do without it. Starved of water, a way of life is fast drying up. It is becoming difficult to cultivate even one season. A proud people and a strong economic system is on the verge of erasure. Lack of water does not only impact agriculture. It effects the entire eco system. It also disrupts the relationship between the community and the natural world. Desperate villagers began laying their hands on trees they once venerated. A people who would not offer a drop of water to those who ate beef, began slaughtering cattle. Instead of rebelling against entrepreneurs who set up prawn farms on the grazing land formerly used by their cattle, they have begun selling or leasing the land they once held sacred. Finally, after polluting the beneficial waters, these racketeers left, leaving the community without clean drinking water. A civilisation that stood ramrod straight in the face of several violent invasions, is on the verge of perishing under the terrible onslaught of our own politicians and their lackeys. This is how the final chapter of a wonderful story often gets written. And yet, all is not lost. People do not always succumb without a fight, especially those who are descended from a tradition that knows how to fight and survive. They continue to fight, for their lives and their way of life. They stop the Deduru Oya with sand bags so that they can lift one foot of water into the Sengaloya. They know the answer to the question, "what is to be done?" "Stop the illegal sand racket in Deduru Oya for just two years, and the river bed will rise again," they observe. Who will hear their pleas? When "the nation" is a term that fails to warm the heart, is it not appropriate to say, "Anawilundawa gena kumana kathada!"? Perhaps someone, somewhere will listen. Perhaps people will realise that it is best to assume that no one will listen. Perhaps it is best that they take the future into their own hands. They are the sons and daughters of gentle and creative people who knew how to fight. These qualities must reside in their genes. Perhaps there will be better harvests.